Let me start off by saying that I love beets. 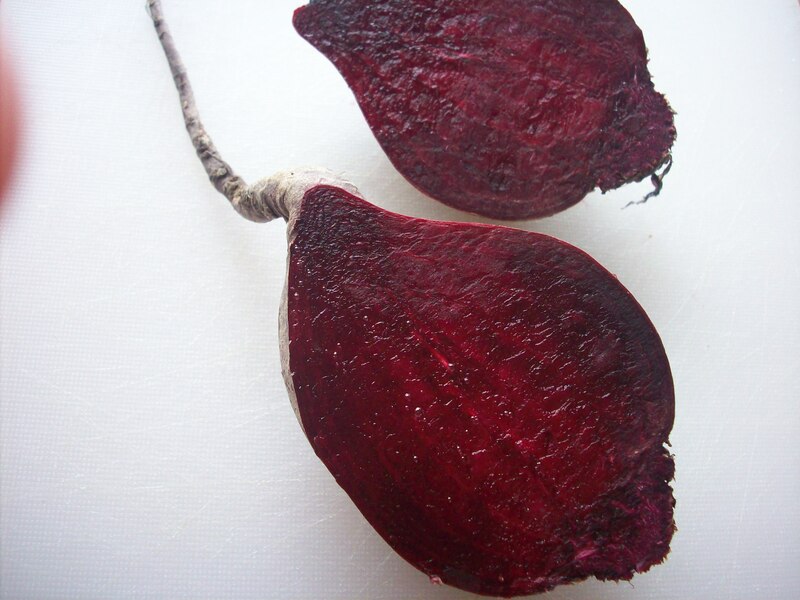 I think they are delicious, beautiful, good for you and often overlooked. So what if they are a bit rough around the edges? They are beautiful … on the inside. Like diamonds (or maybe rubies?) in the rough. I even found the trimmings, long rat-tail roots and gnarled stem ends, lovely enough to photograph. As a lover of beets, I will have them nearly any way that I can get them. 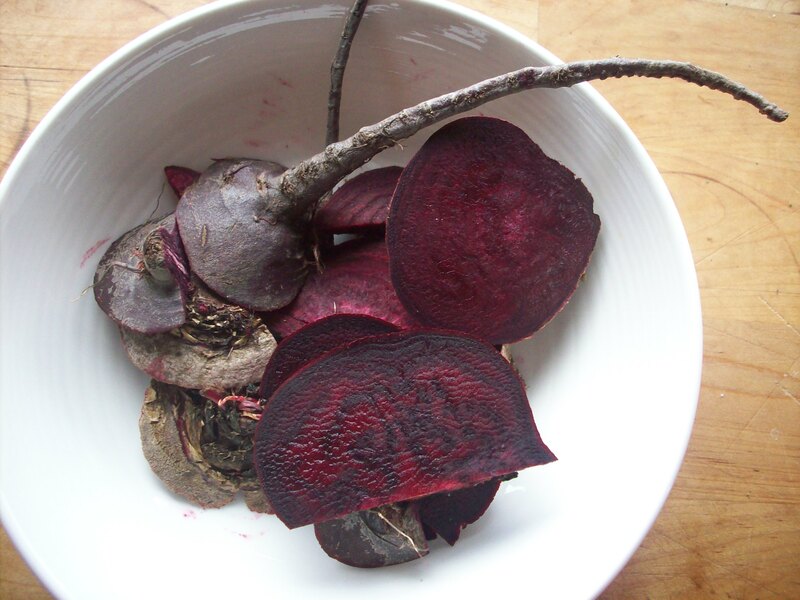 I love them raw and finely grated in salad, steamed or roasted along side meat, or thinly sliced and dried in a low oven as beet chips. Their colour, earthy fragrance and distinct mellow flavour all really appeal to me. 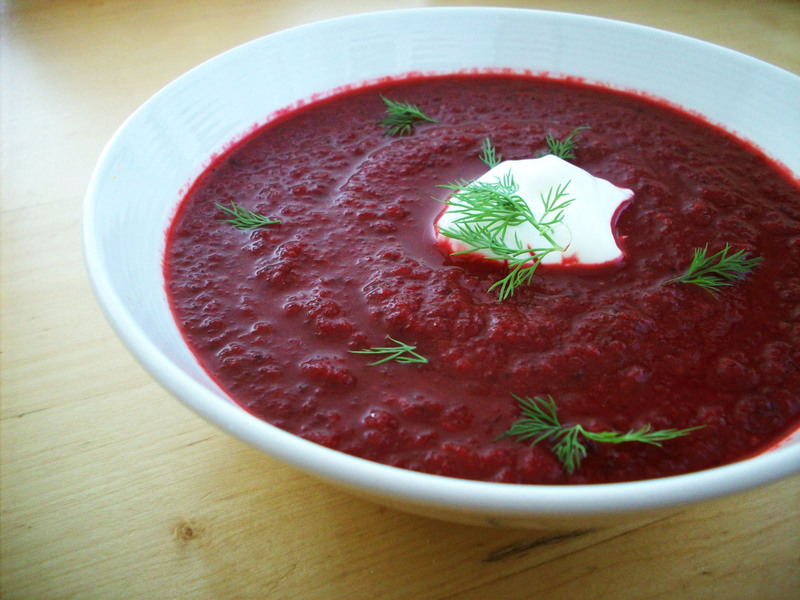 Another way that I like to get my beet fix is in borscht. After I made this deep savoury-sour magenta soup I realized that I actually know nothing about it, other than how to make (one version of) it. A quick jaunt over to Wikipedia told me that there essentially as many versions of borscht as there are Eastern European countries that make it. Like so many recipes, region by region there are noticeable differences. Some have tomato, others meat or cabbage. 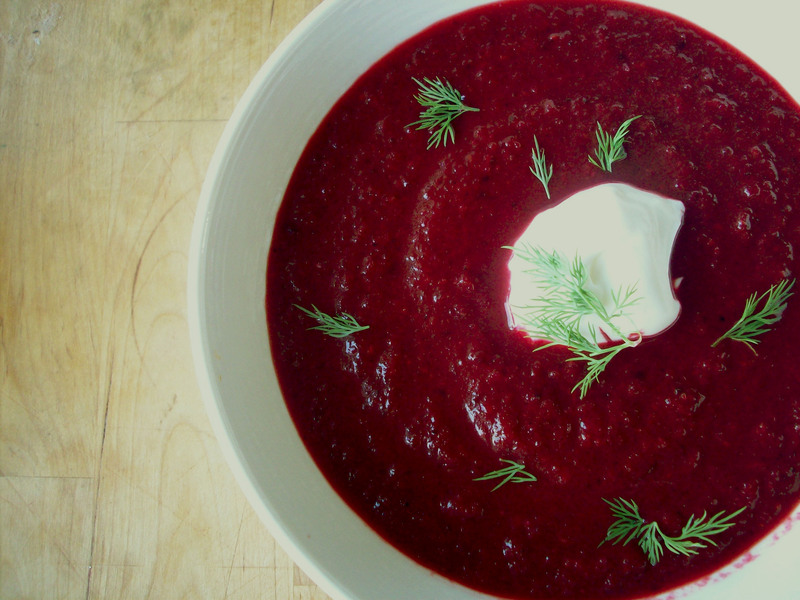 This recipe is simple by comparison to others out there but it gives you the hot savoury and sour punch of any other borscht and it’s a breeze to make. They were then drizzled in olive oil (about 2 tablespoons total), and salt and pepper, cut in half and roasted on a rimmed cookie sheet for 2 hours at 350 degrees. They were done when a sharp knife slipped into them easily and they were a bit shrunken and caramelized. Because the skins weren’t very thick, I left them intact. Had they seemed tough or leathery, I would have skinned them while still warm from the oven. 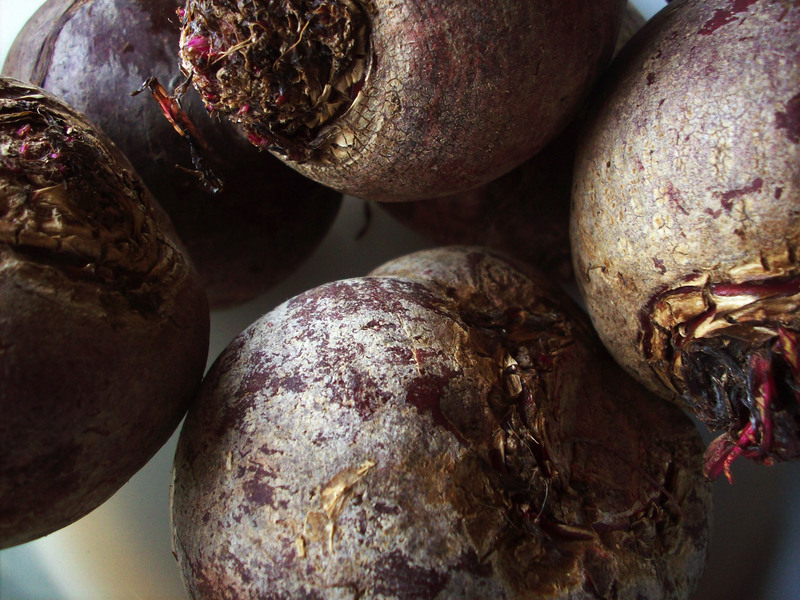 Once they were roasted I chopped up the beets and set them aside. Easy. 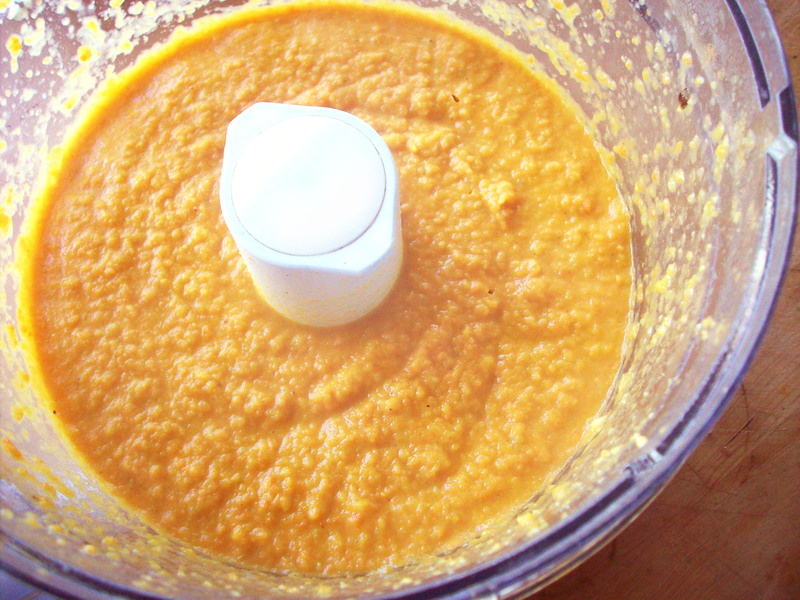 After the beets got a bit cooler I tossed them in the food processor and blitzed them into a coarse puree. The basic components of this hearty soup are 2 vegetable purees, one of which is beet, some liquid, in this case chicken stock, and an acidic component. 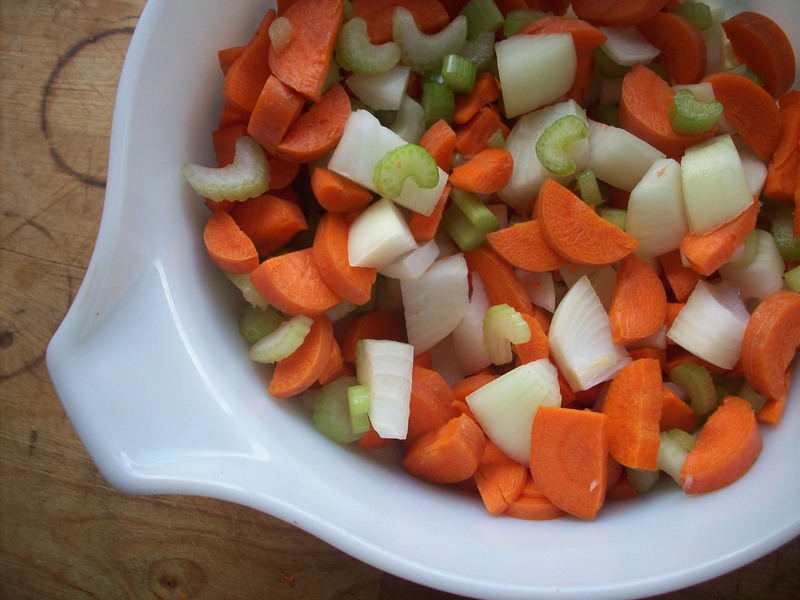 As is the case with so many things, the flavour is built with the trio of onion, celery and carrot. The trio then became a quartet with the addition of chopped apple. 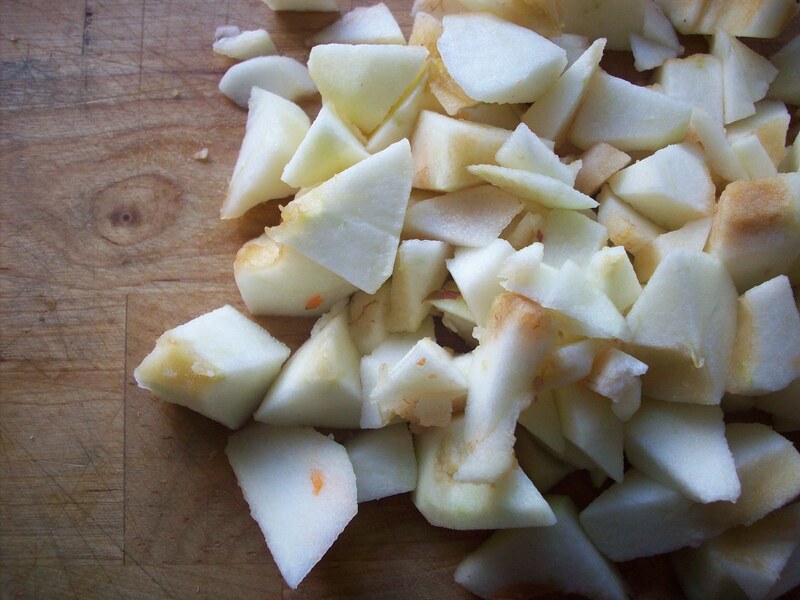 I used 2 peeled, cored and chopped medium sized spartan apples, about 2 cups of apple pieces. Once the apple, vegetables and aromatics were softened and somewhat caramelized, I blitzed them in the food processor like I had done with the beets. Not appetizing to look at but very, very tasty. Then in a large stock pot I combined the beet puree with the vegetable puree and added 2 cups of water and 1 litre of chicken stock. I like it fairly thick, so use your judgement and add more or less liquid to your liking. For the sour flavour I used 1/4 cup of balsamic vinegar but you can play around with the sour level if you like. The beets and apple are quite sweet, so it can take quite a bit of vinegar to get the acidic punch you might be looking for. I seasoned it to taste with sea salt and black pepper and brought it to a boil. To serve, we ate it with sour cream and fresh dill. Delicious!